Growth Habit: The plant forms a rosette 150 to 350 mm in diameter. The first leaf is not normally lobed at the base, but the second and subsequent leaves usually have lobes which are completely separated. The mature plant is erect in habit with stems branching from the base and along their length. The plant may reach a height of 1.4 m, but more commonly grows to 60-90 cm. The stems are solid with a pithy core, fluted or circular in cross section with shallow grooves, have dark longitudinal striations, and carry scattered hairs. The degree of hairiness is very variable. Lower stem leaves, which reach 300 mm in length, are petiolate and usually lobed at the base. The upper stem leaves are much shorter, have short or no petioles, and do not normally have basal lobes. Scattered hairs are usually present on the upper and lower surfaces. Type of Plant: An annual, generally germinating in the Autumn. Flowers: The inflorescence is terminal. The bright yellow flowers are some 12 mm in diameter and have four petals. Fruit/Seed: The fruit is a pod containing 1 to 2 oval, brown seeds. The seeds are hard and may remain dormant in the soil for many years. Dispersal: Charlock is spread entirely by seed, which may be spread short distances by wind, water and soil movement. Distribution: Charlock is widely distributed in the South of the State, but much more localised and restricted in distribution in the Northern half. It appears to be more prevalent on heavy than on light soils, though it is known to be capable of growing on red soils. It is a weed of roadsides, waste areas and crops, and is of considerable importance, especially in cereals, in the South due to its strong competitive habit and its ability to overgrow and swamp crops. Status: Sinapis arvensis is not a declared weed under the Noxious Weeds Act 1964. Charlock is a very persistent and competitive weed once established. Large quantities of seeds are produced each year, thus eradication of established infestations requires several years of vigilant work. It is capable of causing substantial reductions in crops such as cereals and brassica crops such as canola. Similar Plants: Charlock is extremely difficult to separate in the seedling stage from Wild Radish. In general the first leaf of Charlock does not carry lobes at the base, while that of Wild Radish does. This characteristic, however, is not definitive. The leaves of Radish are rough, while those of Charlock tends to be smoother and rather shiny. The leaf tip tends to be more rounded. Charlock, unlike Wild Radish, seldom forms a completely flat rosette, the leaves usually being semi-erect. 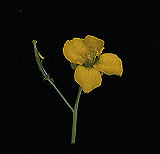 In the mature plant the petal shape and size serves to distinguish the two species; Charlock flowers are always bright yellow while those of Radish are pale yellow, lilac, or white. In Radish the sepals are pressed against the back of the petal, while in Charlock they stand away. Charlock petals are shorter and broader than those of Radish, and are not veined. Wild Turnip is also very similar. It can be separated in the seedling stage by its leaves which have ‘warts’ on the upper surface and are broader in relation to their length, and in the mature stage by the upper stem leaves which are sessile and clasping. Manual removal is effective for small numbers of plants, however established populations may contain thousands of plants, making manual removal impractical. Cultivation is useful during the seedling to rosette stage, however if carried out too late and climatic conditions suit, plants may regrow or still produce viable seed. Grazing should not be used as the plant contains glycosides which are poisonous to stock, although the bitterness of the plant means it is seldom eaten. Several herbicides are registered for use on charlock in Tasmania, including MCPA, 2,4-D, bromoxynil and glyphosate.